Since we are expecting 50mph winds and rain changing to snow tomorrow (and also because I wanted a dry pony for my lesson tomorrow night...), I submitted my application for Pony Owner of the Year by driving 45 minutes to the barn, catching Connor, putting on his heavy with the neck, and driving 45 minutes home. Kidding, I love my little buddy and didn't mind seeing him on a Wednesday at all, especially since it meant knowing that he'd be dry and comfortable tomorrow. I can't help but think 'dinosaur!' every time I see a horse with a neck blanket. It was my first time putting on a blanket with a neck, so of course I nervously adjusted it here and there, wondering if it was so tight he wouldn't put his head down, and then thinking it was so loose the wind would catch it. Finally I struck a happy medium and threw him back out in his pasture, where he nibbled some grass and took off bucking. Stay safe and dry, Midwesterners! Nothing like winter weather. :) Cuna wears a neck when it's super cold (high of 24 yesterday, yay) and I think it's pretty adorable. Oh you are a good mom! That's a lot of driving to make sure your baby is warm :) I have to go through a checklist when I'm looking for Simon in the dark, because in our field there are probably about 10 other bay Thoroughbreds that I have to rule out first. Any reason for the neck? I need to clip Annie a little more but I don't want to mess with a neck on a blanket. I also rode yesterday and not today! My horse is still in a sheet though. High of 24?! And he is full-clipped? How much turnout? I know people do that and it totally works, but I am still a paranoid basketcase. Your blog posts make it seem like you live in like, Oklahoma - not too cold, but not too hot. Sometimes I have to remind myself that you do live in the frozen tundra. What kind of blanket is that? Connor is cute as always! 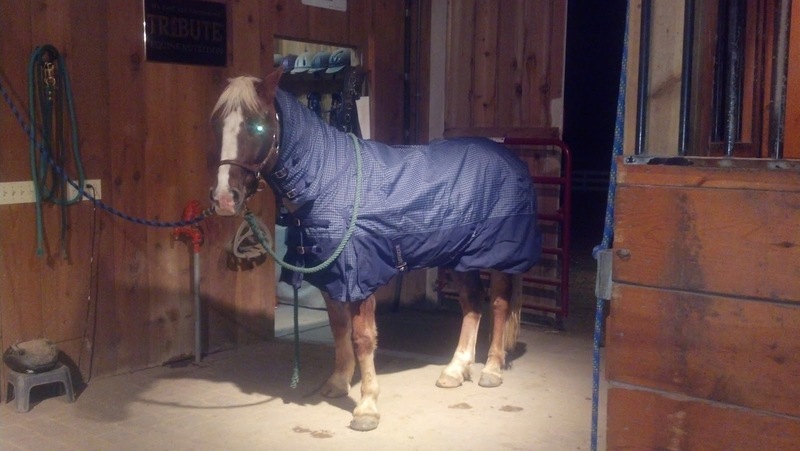 Hillary, it's the TuffRider 1200D Thermolined turnout blanket w/integrated neck. It's supposed to be as warm as a heavy without all the bulky fill, it has this crazy blue "thermolined" fabric on the inside. I really like it so far, he was almost too warm in it when I went to put it on him the night before the storm, when it was around 40. We'll see if it holds up, though, my other TuffRider is not.